see below about Hakusan belief. headquarter of over 2000 branch shrines and temples.
. Hakusan Shrine in Tokyo . People try to get a paper blossom from the decoration hung up at the ceiling. It will bring good luck and fortune for the coming year. The paper blossoms are cherry, chrysanthemum, camellia, peonies and poppies. The famous dance 長滝の延年の舞 is performed. This festival is an important folk cultural asset. 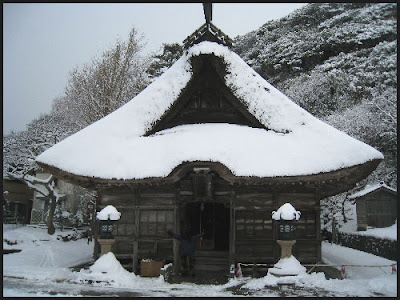 The shrine is located in Gifu, Gujo Town, Hakucho village. This shrine is one of the most important Hakusan shrines in Japan, best known for its Hakusan Mandala. Famous for its drums, which make the sound DEDEDE . . .
Two children clad in ancient robes and hats have to shoot12 arrows in exchange with a priest. Depending on the hits, the weather and a good or bad harvest of the year can be forecast. 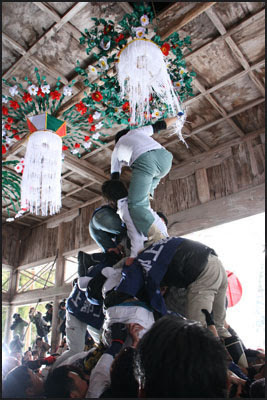 This is one of the oldest rituals in Japan, involving the Hakusan belief of mountain worship. The region is famous for ancient findings of gold mines. First an animistic belief, now featured by Tendai Esoteric Buddhism. Hakusan is the collective name given to the three mountains Gozenpō, Ōnanjimine, and Bessan located at the intersection of the regions Kaga, Echizen, and Mino. Hakusan shinkō is the faith based on the deification of these mountains. Local farmers believed that Hakusan was a mountain inhabited by "water kami" (suijin), dragon kami (ryūjin), and the spirits of the dead. Fishermen of the Japan Sea worshipped Hakusan as a kami of fishing and seafaring. The Jinmyōchō section of the Engishiki records a "Shirayamahime Jinja" in Ishikawagun, Kaga (Tsurugimachi, Ishikawa Prefecture), but after the medieval period when "kami and Buddha syncretism" (shinbutsu shūgū) developed, it became customary to read "shirayama" as "hakusan" (both are readings of the characters 白山). There are various theories as to the preponderance of Hakusan shrines (jinja or gongen) in eastern Japan in areas where outcastes (hisabetsu) live, but the reason for this are unknown. There have been various "enshrined kami" (saijin) claimed for the shrine, but currently Kukurihime no kami (i.e. Shirayamahime no ōkami) is the main kami worshipped alongside Izanagi no kami and Izanami no kami. Kukurihime no kami 菊理姫命 is worshipped at the shrine okumiya on Mount Gozenpō, Ōnamuchi no kami is enshrined at Ōnanji Jinja on Mount Ōnanjimine, and Ōyamatsumi no kami is worshipped at Bessan Jinja on Mount Bessan. The Shirayama no ki, however, states that the indigenous "land master kami" (jinushigami) gave his land to Hakusan Gongen, and moved to Mount Bessan. This story is thought to reflect the expanded power of people who worshipped the newly Buddhist-styled Hakusan Gongen. Hakusan was a "mountain where the kami abides" (shintaisan) (which was taboo to ascend), but along with the development of Shugendō people began to ascend the mountain. Legend claims that the "mountain was opened" (kaisan) by Taichō Shōnin at the beginning of the Nara Period, but his name does not appear in sources from that era. However, his name does appear in such Heian Period documents as the Taichō kashō denki and the Shirayama no ki, and therefore we can surmise that there were already people climbing the mountain for worship in the Heian Period. The Shirayama no ki was copied 1439 but the original manuscript is believed to date back to the Heian Period. According to this text, Mount Gozenpō, where Kukurihime no kami is enshrined, was referred to by the name Zenjō (meditation), the kami was called Hakusan Myōri Daibosatsu, the "original Buddhist deity" (honjibutu) of Kukurihime no kami was the Eleven-faced Kannon (Ekadasamukha Avalokitesvara), Ōnamuchi no kami was the Buddha Amida (Amitābha), and Ōyamatsumi no kami was Shō Kannon (Ārya-Avalokitesvara). 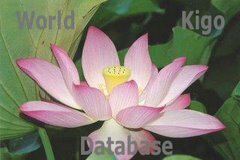 The text also records the legend that if one drinks water from the lake Midorigaike, where Hakusan Myōri Daibosatsu was supposedly born, one would achieve the "merit" (riyaku) of an extended, long life. Documents place the site of Shirayamahime Jinja in Kaga, but there were three routes for climbing the mountain, from Hakusan Kagababa, Hakusan Echizenbaba, and Hakusan Minobaba, indicating that pilgrimages could start from each of the three regions that the mountain straddles. The mountain pilgrimage route is called a zenjōdō (path of meditation), the entrances to the mountain trails are called baba, and there were also places to worship from a distance. Along the pilgrimage route are shrines called Hakusan Shichisha (the Seven Shrines of Hakusan). Women were permitted pilgrimage as far as the center shrine (Chūgū). We can imagine that many people made pilgrimages to the shrine as a result of the use of such materials as the Shirayama no ki and Hakusan sankei mandala paintings for preaching about the merits of Hakusan. 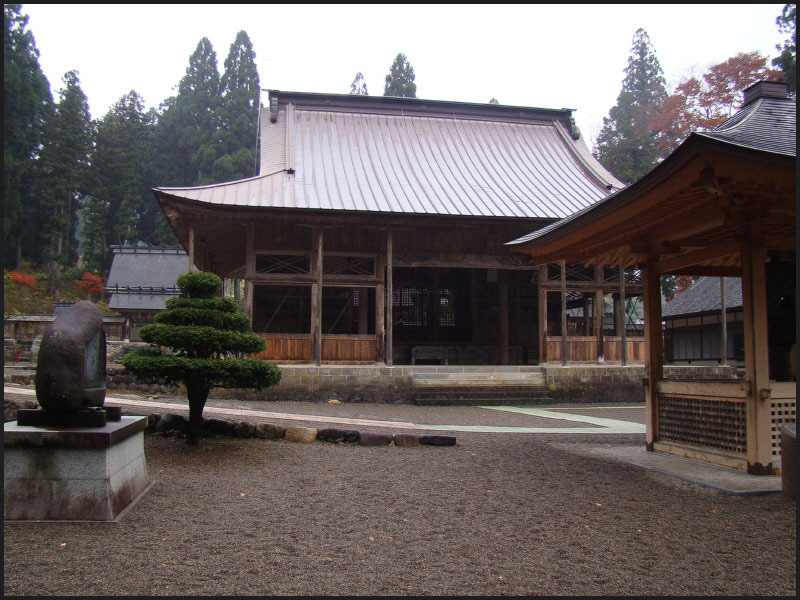 Lodging facilities were established at the baba sites to accommodate pilgrims, and a system of Hakusan "associations" (kō) developed, in part due to the activities of oshi. Thus the cult of Hakusan spread. and today 2000+ nationwide Shirayama Jinja Shrines 白山神社 (also read Hakusan Shrines) are devoted to this faith. The characters for Hakusan are also read "Shirayama." Hakusan is undeniably one of Japan's most important and ancient sites of religious mountain worship (sangaku shūkyō 山岳宗). The Hakusan mountains are celebrated in the Man'yōshū 万葉集 (Japan's oldest anthology of verse compiled in the 8th century). Over the centuries, Hakusan became a stronghold of Shintō-Buddhist syncretism, a major pilgrimage site, a center of ascetic practice for the Shugendō 修験道 cult of mountain worship, and the focus of artwork known as the Hakusan Mandala. Today Hakusan is considered one of Japan's three most sacred mountain sites (Nihon Sanreizan 三霊山 or Nihon Sanmeisan 三名山). The other two are Mt. Fuji and Mt. Tateyama. Izanami no Mikoto (伊邪那美命 or 伊奘冉尊 or 伊耶那美命).
. The Hata Clan 秦氏　Hata Uji . In 117年 he climbed mount Hakusan in Echizen province and became a "super Bosatsu"
Ashioo Sha 足王社and Ashi-O Shrine "for the deity of strong legs" . The various Hakusan shrines are often visited by haiku groups. Matsuo Basho and there is now a stone memorial. "The bell for ebb and flood"
Legend knows that this bell made a sound when the tide was coming up, so that the villagers know it and the children can take care on the beach. The original bell was lost in a fire, but later replaced from the leftovers of bronze that could be found. It is 107 cm high and has a diameter of 68 cm. It was made in 1499. Now it is at Itoigawa 糸魚川市大字能生7239（白山神社). When Yoshitsune fled to the North of Japan around 1185, the village had about 7 homes of fishermen. Basho wrote a few haiku at the village, while he stayed with Tamaya Goroemon 玉や五郎兵衛. "The sound of the bell has taken to it the form of the mist, lingering here, hurrying there, trailing and swirling through the damp air. Compare Onitsura's verse, Vol. II, page 91." This summer hokku is from early in the 6th month (July) of 1819, the year Issa evokes in My Year (Oraga haru), soon before Issa's beloved baby daughter died on 6/21. In 1824 Issa wrote another version in which he uses teka-teka to, 'shining, glistening, lustrous' instead of kira-kira to. 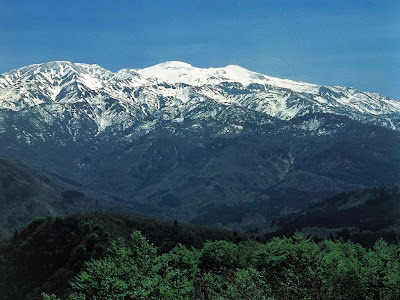 Mount Hakusan (2,702 m, 8,865 ft.) is the highest mountain to the southwest of Issa's hometown area, and he is apparently able to see the long, high ridge that forms its peak in the distance. The mountain may get its name ("White Mountain") from the snow that remains even in the summer. Along with Mt. Fuji and Mt. Tateyama, Mt. 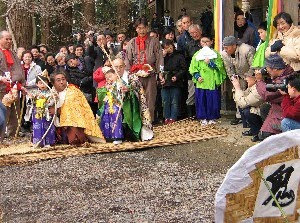 Hakusan was in Issa's time one of the three most sacred mountains in Japan, and Yamabushi mountain monks spread belief in the deity of the mountain, a female god named Shirayama-hime no Kami, around Japan. Even today there are more than 2,700 shrines around Japan devoted to worshiping the mountain, which is believed to be the body of Shirayama-hime, who is accompanied there by the two primal parent deities in Japanese mythology, Izanami and Izanaki (also called Izanagi). In Issa's time both Shinto believers and Buddhists (often the same people) made pilgrimages to the mountain, and Buddhists believed the female mountain deity was a manifestation of the androgynous bodhisattva Kannon. The Zen master Dogen saw the Hakusan deity in a vision once, and he prayed to her as the shamanic protector of Eiheiji, the large Soto Zen temple he founded. The mountain was also revered by the haikai poet Chiyojo, who, as Issa surely knew, was born not far from Mt. Hakusan. In the present hokku Mt. Hakusan, with its snow shining brightly in the strong summer sun, is not simply a physical mountain but a luminous visionary presence, and in spite of the summer heat its coolness comes across the distances and makes Issa feel cooler. This hokku is worth reading out loud in Japanese just to hear the sound. The play of a, i, and u vowels and the repetition of k- in the sequence ku...ki...ki...ki...ka is striking and adds to the sensation of brightness.
. Hakusan Shrines in the WKD .
. Kanko odori かんこ踊 Kanko Dance festival . in honor of Saint Taicho coming down from the mountain. 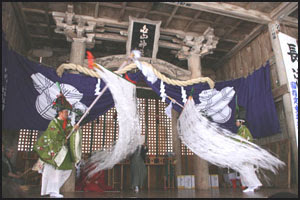 Yamanokami is seen as a Tengu.